Please note: there is a $35.00 minimum on all work. A $100 deposit is required on all jobs unless the final bill will not total $100. All jobs require a $25.00 set-up fee. All Texas residents will be assessed 8.25% for sales tax. Rush charges begin at 25% of the total bill. If paying via PayPal, extra fees of 3% will be incurred. 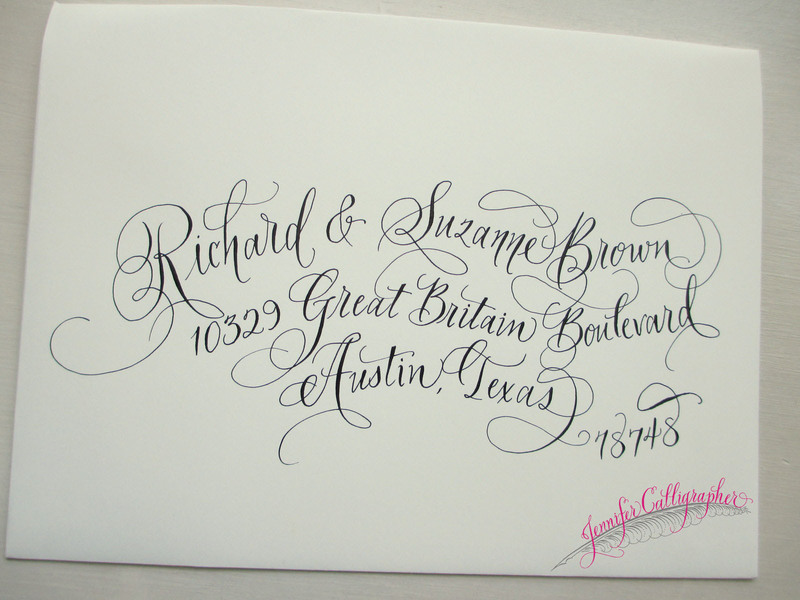 Wedding Invitations orders, Table Cards, Menus, Programs, Napkins and More: contact Jennifer for estimates. (special note: I offer two minor revisions to the artwork. There is an additional charge starting at $50 for any changes thereafter). Monogram designs: starting at $125. Pricing subject to change based on the complexity of the monogram. Envelopes – PLEASE NOTE that a $15 set-up fee is incurred for any additions to your guest list after the completion of the job. It is of utmost importance to have your list proofed thoroughly, prepared in a mailing label or flush-left format, and printed for my use before we begin! See the ‘Preparing your Project’ page for additional information. Note that I shred lists upon completion of jobs, and delete email correspondence. 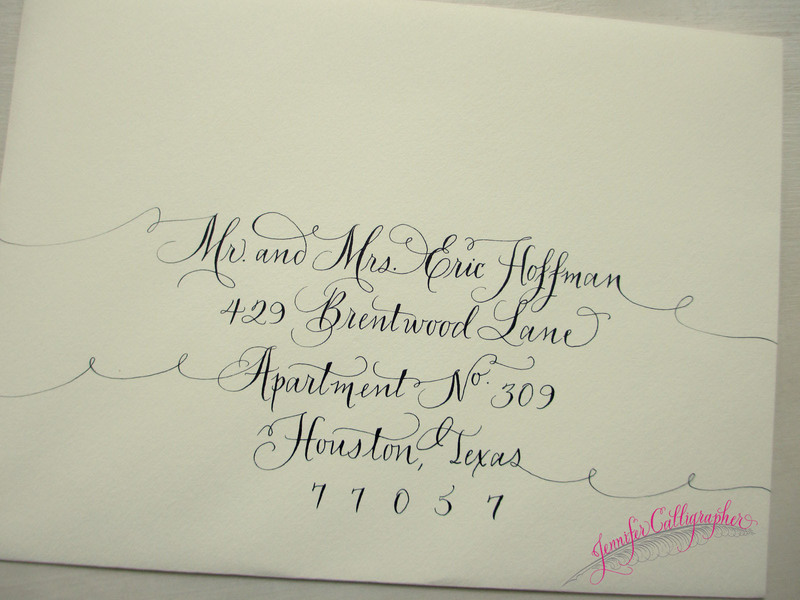 Any changes to addresses already written will incur an extra fee of $1.00 each plus the cost of the envelope. If your guest list has not been proofed and I encounter misspellings and incorrect information consistently throughout the list, requiring extra time and research on my end, there will be a flat fee of $50-100. Kindly proof your list. 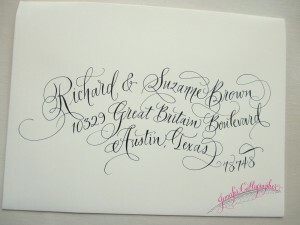 -Ink Colors: black is a favorite and no extra fee is incurred! Additional charges for custom colors, gold, etc. 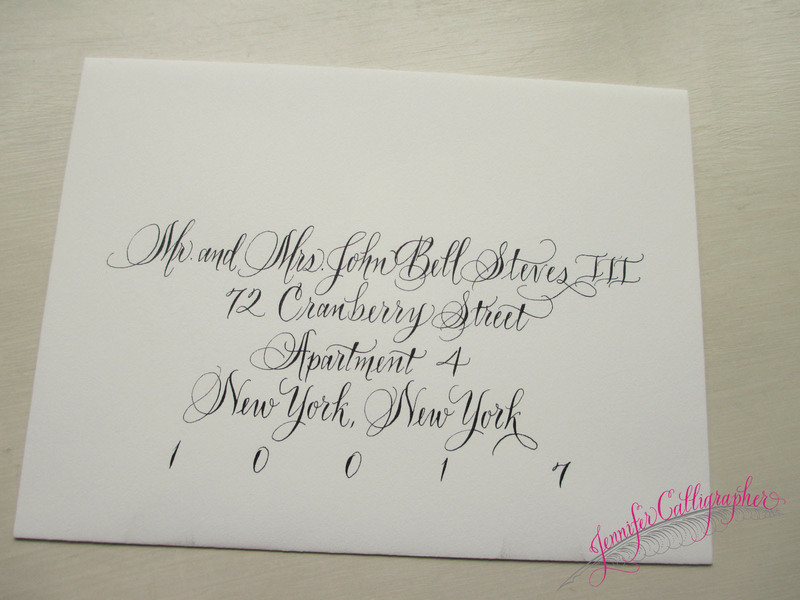 ($10 flat fee for ink and additional fees of $1.00+ per envelopes). -Additional lines on envelopes (there are typically three lines per address. zip code is “free”), add 1.00 per added line on addresses (ex: an additional full name on an additional line). 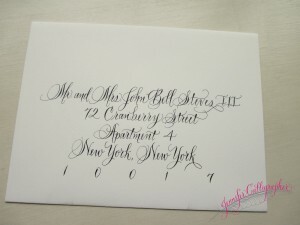 -Ultra-flourished styles (over-the-top fancy with lots of flourish! ), an additional fee of $1.00+ per address. 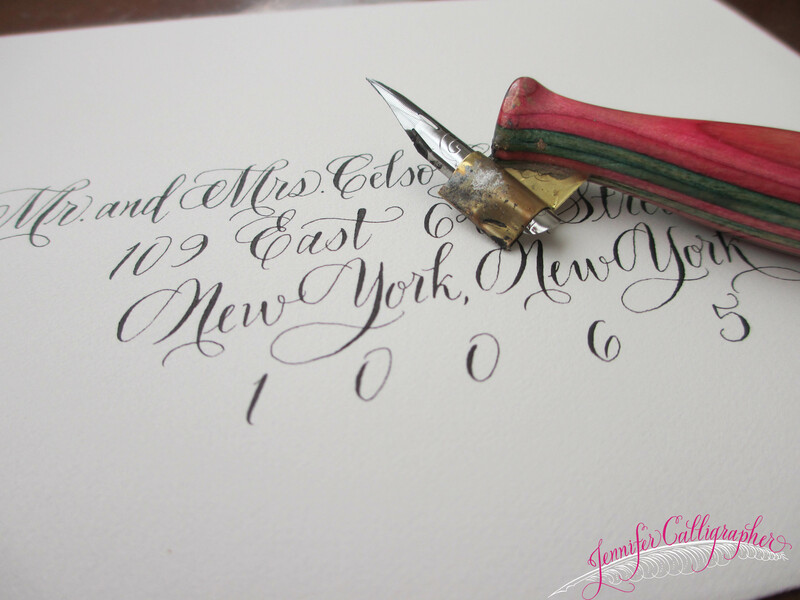 Custom-designed, Rubber Stamp with or without a wooden handle, self-inking (Address Stamp): starting at $50. Place Cards: $1.50 each. Dark colored place cards, $2.00 each. Additional fees for colored inks. Bridal Books: $2.00 per name. 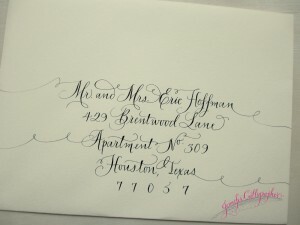 Calligrapher prefers to be contacted by email. Emails are typically replied to on a same-day basis. Estimates can be given prior to acceptance of the job. Charges are to be paid by the client upon completion of job (when the work is returned to the client). Checks are to be made out to: Jennifer Mauricio. Texas residents will be assessed 8.25% for sales tax. Items shipped within the state of Texas are also assessed at 8.25%. Checks that are returned for insufficient funds will receive a $50 fee from Jennifer. It is preferred that the client delivers and picks up their order, or, uses USPS or UPS or FedEx. When packaging your project, be sure it is wrapped in some way to prevent any water or handling damage that could happen. Out-of-state and out-of-town brides: I’d love to work with you, and I have found UPS or FedEx to be our best option for shipping. Please email the calligrapher with add-on names or corrections while the job is being done, before it is returned to you. Additional names sent after the job is completed will incur a $15 set-up fee plus the cost of each envelope. Tax~ All Texas residents and items shipped within the state of Texas will be assessed 8.25% for sales tax.